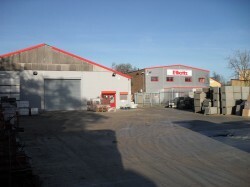 Elliotts, Hampshire’s leading independant Builders Merchant, are making a major investment at their Romsey premises. Elliotts were established in 1842 and are still family owned today, with Stuart Mason-Elliott running the day to day operation. The business has been supplying building materials in the local area for 167 years and has built it’s reputation on customer care, offering a fast and friendly service with good value for money. Today, Elliotts have 11 branches located in the South, including Elliotts Insulation & Drylining and Elliotts Premier Roofing. They also have a Direct Sales Department as well as a Drainage and Civil Engineering division. Romsey was one of Elliotts smallest branches and the site needed upgrading to permit expansion of the product ranges, enabling increased display and storage areas. 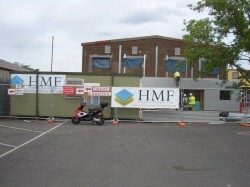 This development will give customers the widest choice of materials and tools in the locality. The contract for the design and fit-out of the re-development has been awarded to Hampshire Mezzanine Floors, fit-out contractors based in Southampton. The £1million contract includes the fit-out of 2 buildings and also complete refurbishment of the existing site allowing for improved traffic systems and customer parking. A modern kitchen and bathroom studio will be located on a mezzanine level in the new building, above a large self-selection shop and warehouse. The existing site will also benefit from substantial improvements including mechanical, electrical and specialist racking installations. These new facilities will give Elliotts customers an unrivalled selection of building materials, accessories and the latest kitchen and bathroom displays. The self-selection shop will stock an extensive range of power tools and equipment for all aspects of building, making this site a one-stop shop. 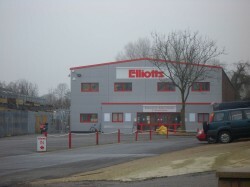 Hampshire Mezzanine Floors are delighted to be awarded this contract having already carried out various projects for Elliotts, including main contractor fit-outs at Elliotts Tool Warehouse in Winchester, Elliotts Insulation, Elliotts Premier Roofing and also projects at 5 further branches.